The event schedule for the much anticipated “Daks over Normandy” event in June 2019 is slowly materializing. 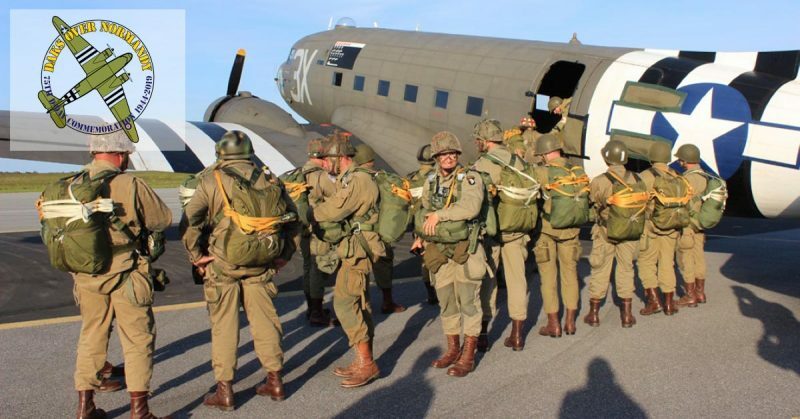 For the first time since 1944, the skies over Normandy will be filled with full squadrons of Douglas C-47 Skytrains to drop paratroopers. Throughout the World about 150 of these ‘winged workhorses’ are still flying and for this very special occasion the plan is to bring about 40 of them together for one last time, during the 75th commemoration of the 1944 D-Day landings. All aircraft assemble at Duxford Airfield UK. Public day. Static Show, airmarket, scenic- & formation flights. Parachutists arrive. Public day. Static Show, airmarket, scenic- & formation flights. Mass Practise jump. Public Day. Day of the Channel Crossing. The exact route will be published. A pair of Douglas DC-3 and C-47 Dakota painted with invasion stripes. Day of festivities all over Normandy. Parachute jumps all over Normandy Peninsula. Mass jump at La Fiere dropzone. Day of departure of all aircraft. 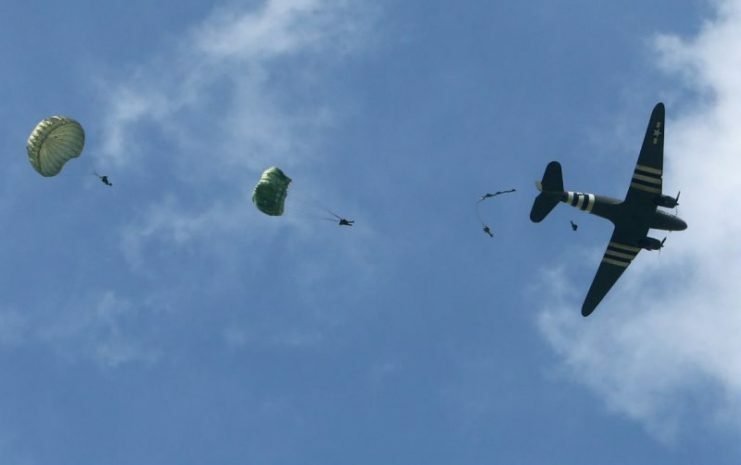 This Friday 20 April the registration for the parachutist will open. At this moment there are about 250 slots available for the evening of 5 June Cross Channel Flight and that number increases with every new aircraft. The expectation is that these slots will be gone in a matter of hours. The Cross Channel flight itself will be a sight to behold, as all aircraft, escorted by a number of fighters, will be in one large formation. It is something the World has not seen since World War 2. The organisation will publish the exact route the formation will fly, so people can set their schedule to be present somewhere along the route. 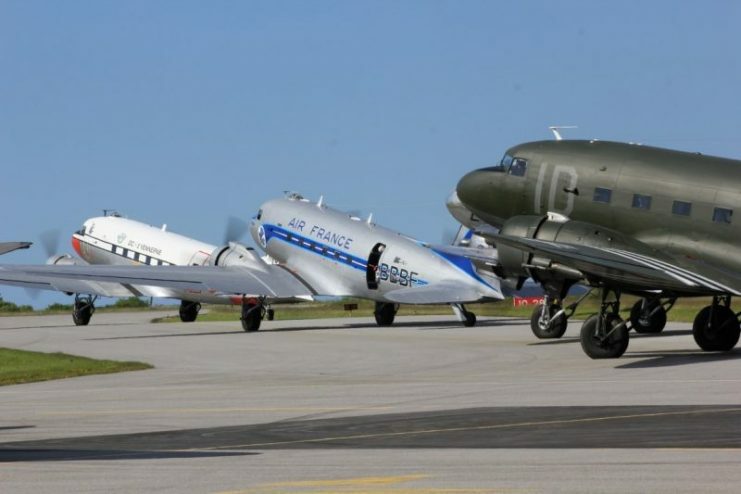 For tourists and spectators who will participate to the event, the organizers are arranging scenic flights at Duxford Airfield for 3 and 4 June and at Caen Airport for 7th and 8th of June.The scenic flights in the vintage Douglas DC-3 Dakota’s will take passengers over the Cambridgeshire, Norfolk and Suffolk countryside. Over Normandy, they will be able to admire the historic towns and places such as Pegasus Bridge, Ouistreham and the Gold, Juno and Sword invasion beaches. Peter Braun, Daks over Normandy Event Director says: “The program is ready and we’re getting all authorizations in. At this moment we are still in search of major contributors. As you all might understand for our endeavors we need a considerable amount of aviation fuel. Any donations can be made through our website and they are highly appreciated. For sponsors, we have a very attractive sponsorship program. One of them is a VIP flight over Normandy on a DC-3 with complementary champagne! And since we are a registered as a not for profit organization, donations are tax deductible.